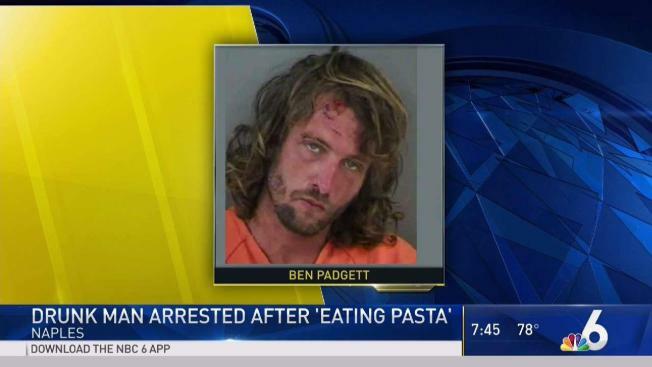 Ben Padgett was arrested at a Naples Olive Garden for disorderly intoxication after he was spotted shoveling spaghetti into his mouth, police said. A Florida man was arrested at an Olive Garden after police say he caused a drunken disturbance and was shoveling spaghetti into his mouth with his hands. Ben Padgett, 32, was arrested by police in Naples on April 7 on charges of disorderly intoxication and resisting an officer without violence, according to an arrest report obtained by the Miami Herald. The report said officers responded to a disturbance call at the restaurant and found a shirtless Padgett chowing down on the spaghetti. Padgett smelled like booze and was "muttering obscenities," the report said. A restaurant worker told police Padgett caused a scene inside the restaurant and had been asking patrons for money outside and yelling expletives, the report said. Officers gave Padgett paper towels to clean up the pasta on his face, the report said. After he was taken into custody, Padgett started smashing his head against the metal cage partition in a patrol car, causing him to cut his head, the report said. Padgett was booked into jail and later released on $2,000 bond. Attorney information wasn't available.